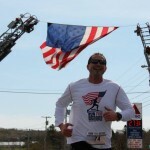 On Saturday, May 9th, 2015 over 250 Mainers gathered in Presque Isle, ME to honor 8 of Maine’s bravest at the Run for Heroes 5K. 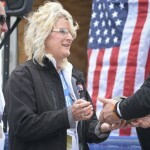 The Summit Project partnered with CompetitorME to create an event that Northern Maine residents of all ages could attend and learn about The Summit Project’s mission to honor post-9/11 fallen heroes from Maine. The day began with a 1-mile Kids Fun Run where children from ages 2-15 were able to learn about these soldiers, participate in a kids race, and then receive medals at the end for participating. Many kids were part of the Mars Hill “After the Bell” program coordinated by Jamie Guerrette who also ensured the children understood why they were running – to honor our fallen heroes. They posed pre-race with a banner that read “Real Heroes don’t wear capes, they wear dog tags!” One of the runners was a Gold Star Family member, and he was so proud to be able to run for his uncle. There were many people there to cheer on the kids, and there was even an appearance by Focus the Clown (a veteran of the US Navy himself) who took a break between shows with the Shriners to show support for the kids. Six of these brave men were represented by stones from The Summit Project, and two were represented by bibs carrying their names. Aroostook County residents Julian Szabo, Heather Fullen, Barb Lovely, Don Eno, Danielle Lombard, and Chris Robinson carried these soldiers stories. All eight of these soldiers were learned about, carried through the 5K course, and then had their story shared at the finish line with everyone. The stones were carried along Presque Isle’s bike path to North Street – where both the Caribou and Presque Isle Fire Departments raised a flag over North Street between their ladder trucks. The stones then made their way down Main Street towards the bike path on Chapman Street. 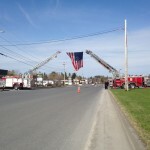 Presque Isle Police Officer Kevin Reed assisted in organizing law enforcement officers from Presque Isle PD, Caribou PD, Maine State Police, Aroostook County Sheriff Department, and Maine Forestry Service saluting the soldiers as they passed through. The Maine Forestry Service also brought their helicopter for a fly over at Riverside Park. 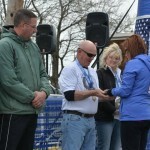 Many of the runners and volunteers at Saturday’s events were either Active Duty or Veterans themselves. As the stones were carried through the final stretch of the bike path towards Riverside Park, they traveled between 1/4 mile of American flags before crossing the finish line where four flags donated by Senator Collins and Senator King marked the end point. These flags were flown over the US Capital in honor of fallen soldiers from Maine, and it seemed only fitting that these flags were also flown here to honor these Northern Maine heroes. The Summit Project’s mission comes in three parts – Learn, Hike, Letter. At the summit of each hike, a hiker participates in a Circle Ceremony where they are able to share what they learned about the fallen service member they are honoring. 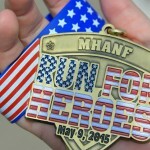 Run for Heroes stayed true to this model, and each person that carried a soldier’s story was able to share that story with all of those in attendance. While everyone knew the reason that we were all in Presque Isle on that day, this is the moment that it all truly struck a chord. Even The Summit Project volunteers were taught new things about each of the soldiers that day as we learned that these athletes had not only read about the heroes on our website, but some had taken the time to reach out to the families, sit with them, listen to their stories, and then share not only the great loss but the amazing lives these soldiers led during their brief time here. During this ceremony, Dylan Harris, brother of SPC Dustin Harris, asked “Are we going to do a stone exchange?” While not every soldier’s family was able to attend, we had several Gold Star Family members at the event that day. 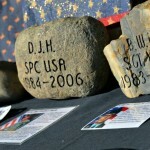 Dylan provided the perfect piece to close out the race – each of the family members were able to participate in an exchange of the stones where the athletes were able to hand the stones to the family, give them a hug, and more importantly give them the assurance that Maine Heroes Are Not Forgotten. Photo credit to Lyndsey Cheney Maynard and Jessica Oullette. It was a foggy day with very limited visibility, but the weather seemed to fit with the purpose of the hike. We stepped off at 9:15am, and each of us knew we would not see the view of Echo Lake that so many seek at the summit. But the view wasn’t what the hike was for, and so the view was not important. 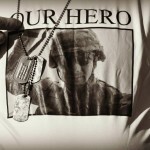 As we hiked through the woods, we reflected on the soldiers and the Run for Heroes event we had just taken part in in their honor. 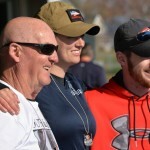 Jonathan, Renee, and Jessica had worked behind the scenes at Run for Heroes, and so this was their first true experience being immersed in The Summit Project’s mission. The closer we got to the summit, the quieter we all became. We stopped near where most hikers enjoy the view of Echo Lake. As everyone removed the stones from their packs, I shared more of what makes The Summit Project and it’s mission so special. I spoke of the soldiers we honored, the families I had met, and the amazing impact I had seen in these families, the volunteers, and entire communities. But of all the events we take part in, the smaller, more intimate non-hosted hikes are special in their own way. 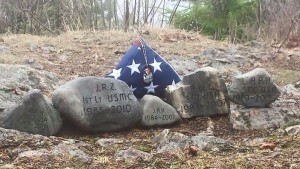 Each of us spoke of our soldier and placed their stones together at the summit. 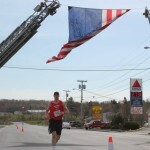 Jonathan had brought a flag from the Run for Heroes event to carry in his pack. This was placed on top of a folded cloth with the stones. 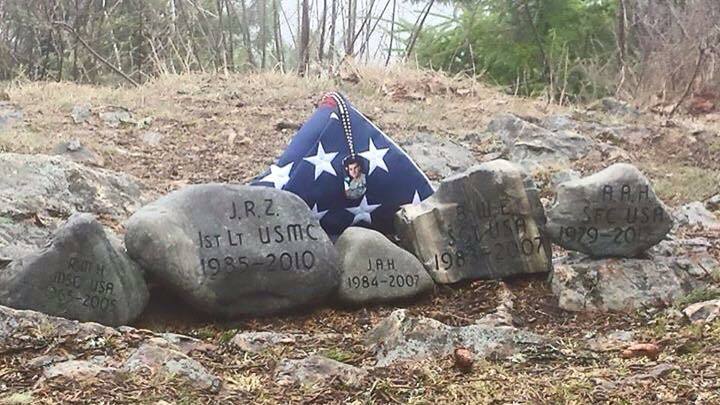 Even though his stone was not with us, I also had the opportunity to share SPC Dustin Harris’s story and placed the dog tags his grandfather James Troutt had given me in the circle in place of Dustin’s stone. Everything was so quiet as we stood and just took in the moment – then the fog began to clear showing us Echo Lake. James Troutt always tells me that there are signs if we only look. I think maybe this was one of those times. We paused for a few minutes just to take it in before taking a few photos for The Summit Project and returning the stones to our packs. I’ve always noticed that the hike up a mountain is full of anticipation, energy, and bonding as a hiking team. The shared purpose brings us all together in a way that nothing else does. But the hike down is always much quieter as each hiker reflects on the importance of what they have just done and the responsibility of writing to the families. Our focus shifts inward to thoughts of what we experienced, what we learned, and what we will carry with us to share with others. After the hike, we had lunch together, and I looked around the table realizing that TSP had just grown by three. Thank you Jonathan, Renee, and Jessica for joining me on the hike of Quoggy Jo and joining the mission to ensure that Maine Heroes Are Not Forgotten.